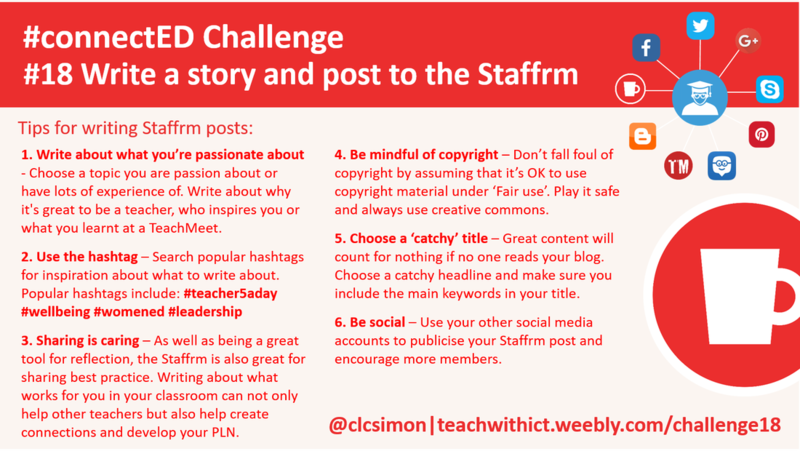 Challenge 18: ​Write a story and post to the Staffrm. Writing your first story can be a little daunting at first however, with a community of non-judgmental/supportive educators, the Staffrm is the perfect place to start. Stories are great for striking up conversations and ideal for making connections with other educators. Best of all, creating and publishing a story on the Staffrm is really easy - and FREE! Choose a title for your first story. Choose a #hashtag. Just like on Twitter, the hashtag is used to categorise your story - this makes it easier for others to find your story. You can use an existing hashtag (see below) or create your own. Type your story in the box provided - making sure that you don't exceed the 500 word limit! When you've finished typing your story, click on Publish. Once published, your story will appear on the Staffrm homepage. Stories are listed in order of date published (Most recent first). Write about what you’re passionate about. Write about what works for you in the classroom. Write about why it's great to be a teacher. Write about what you do to achieve a work/life balance. Write about something you learnt at a TeachMeet or CPD event. Need some inspiration? Check out these Staffrm tips from Stephen Lockyer's: Using Staffrm like a Boss! http://staffrm.io/@markanderson/DvJdPNqtPO - 'You’re Amazing' by Mark Anderson, reminds us of all the amazing things we do as teachers every day. http://staffrm.io/@abster/54gfOKa8Py - 'It’s no sacrifice' by Abigail Mann, reminds us that we shouldn't feel guilty about taking time out for ourselves and our families.